Walking around in a boot, knowing that my competitors are all getting better is the least of my thoughts. 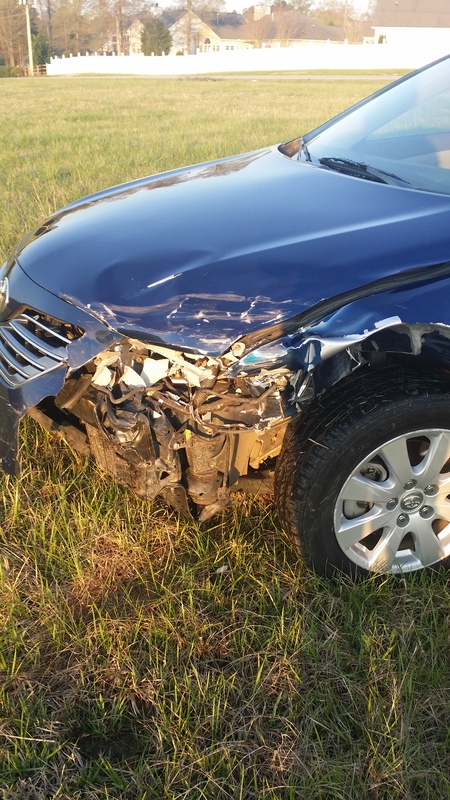 This am, on the way home from running an errand, my car got totaled. 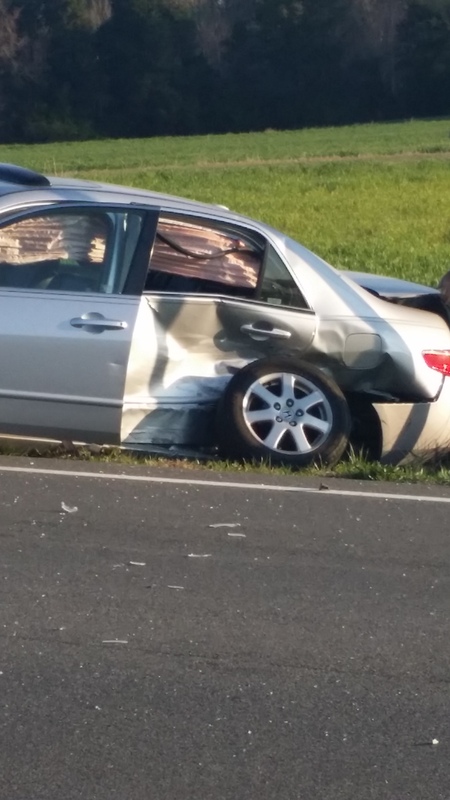 It wasn’t just a wreck….I almost killed someone. Really. She pulled out in front of my car while I was travelling 55 mph. What used to be my primary car. My choices were to T-bone her, hit front to front, or hit front to rear. I decided to impact the car’s rear door and trunk instead of her or the engine. Thank God no one was in the back seat. They would have been killed. The impact knocked the wheel off the car. My car didn’t fair much better. The body shop told me to anticipate the insurance company calling it totaled. The most humbling aspect of this was the ending of the accident. I am standing up, near the intersection, watching the other driver get loaded into an ambulance and taken to a local hospital. I have bruises on my lower legs from the impact and the airbags going off, but I am OK. The medics checked my legs over to see if anything broke upon impact, and, by chance and God’s grace, I was bruised but suffered no broken bones. As the ambulance pulled away, I shook my head in disbelief and answered the policeman’s questions. He told me he was writing the woman a ticket for failure to yield right of way. A witness tells me that this happens all the time at that intersection. Throughout the day, I got some anxiety attacks. I replayed the crash a couple of times. She turned out into traffic; I had about 1 second to decide what to do, and I guessed correctly. What if I hadn’t? What if I had gone to the hospital and she had walked away? The driver’s husband came to find me a few moments after the accident to see if I was OK. He and his wife left the scene of the accident a few moments later, with their car still leaking gas and sitting in a ditch on the side of the road. Meanwhile, I am blessed with a cup of hot tea (my favorite morning beverage) brought to me by my wife. Wow. Can’t count the number of times I said, “Wow,” after this event. Even while typing this, it remains apparent that I got lucky. After arriving and checking in, Alex and I were given starting times 15 seconds apart. It was obvious to me, in the moment of getting out of the car to prepare my son to do a race, that today was not be my day to compete all out. “OK, Dad,” was all he could say. Any time advantage that came from special equipment was his. It was time to start passing this torch to the next generation. “Alex, if I had the time, I would switch pedals and let you ride the carbon bike tonight,” I told him. “Alright,” was all he could say. “Sure, Kid. They have these things all summer long,” was all I could manage. My son looked great in that helmet. We wore one of my jerseys, to boot. 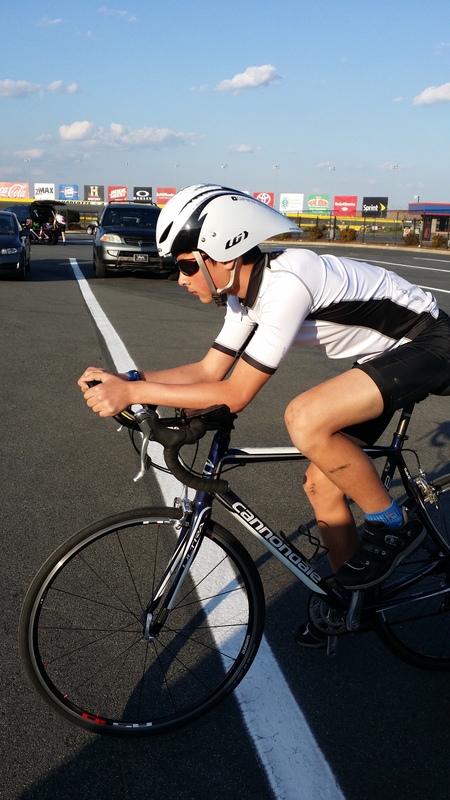 And, for a first take on that track, 31 minutes isn’t bad for a 13 year old on a metal framed bike. Wonder how he will do with carbon framed bike and fancy wheels? Sharon once told me that the goal is not crossing the finish line. It is getting to the starting line. There are many events along the way that derail us, and our physical condition is only one of them. It is how we respond to them that we are remembered and judged. Today was a beautiful day of learning. Now, if I only my legs could heal and stay that way…perhaps I could actually get prepared for the World Championship. Whatever. The objective of life is learn and pass what you learn forward. Today, both of those life goals were accomplished. GOOD read. Thank you for posting this!! Glad you are ok! *hugs* Jeff – very glad you are ok and that you could still be there for Alex! Deep breaths and deep prayers for your health and safety!